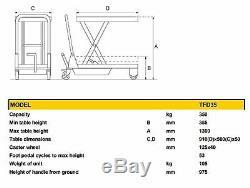 Heavy Duty 350KG DOUBLE SISSOR LIFT TABLE TRUCK TFD-35. Why should you take second best? Heavy duty steel construction with epoxy powder coated finish to give greater ant-corrosion resistance. From an established company with over 30 years trading. Polyurethane Wheels - Be tter on slightly uneven surfaces. Also fitted with a break as standard. 910 x 500 table Dimensions. Ideal for lifting and transporting a variety of goods. Min table height B 355. Max table height A 1300. Table dimensions C, D 910(D)x500(C)x50. Height of handle from ground 975. Carriage shown is for a Business Address in Mainland England, Scotland and Wales. Please provide a contact number for our carrier. Collection is welcome from our warehouse for any of our products. A VAT receipt is provided for all goods. 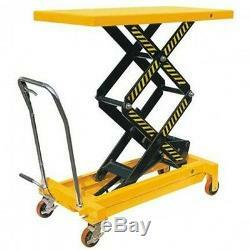 The item "Double Scissor Table Truck TFD-35 350Kg 910mm x 500mm HEAVY DUTY" is in sale since Thursday, October 9, 2014. This item is in the category "Business, Office & Industrial\Material Handling\Carts & Trucks\Drum Trucks & Sack Trucks". The seller is "midlandgroup" and is located in Kingswinford. This item can be shipped to United Kingdom.